The Korean Armistice Agreement (AA) Ended Major Combat in 1953 Since Then, It Has Helped Resolve Dangerous Incidents In March 2013, North Korea Pledged to Throw It Out Said It Before — Serious This Time? 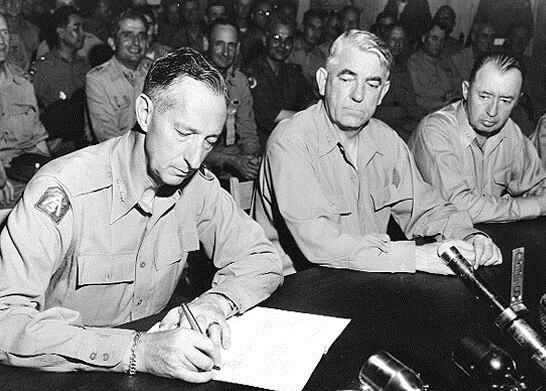 Signed in 1953, the Korean Armistice Agreement (AA) is a military document designed to stop the fighting until a peace treaty could be completed. It created the cease fire, or truce, which has prevailed on the Korean Peninsula in the decades since. The signatories were the United Nations Command (for the U.S., South Korea and UN allied nations) and North Korea for its own forces and its Chinese allies. South Korea did not sign the AA, which has created certain negotiating issues over the years. 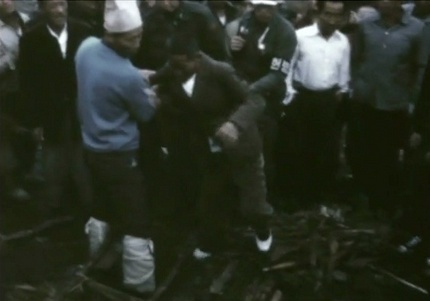 A POW exchange did occur under the AA (for more on the Korean POW issue, visit www.kpows.com). But the 1954 conference in Geneva that was supposed to resolve broader issues failed to produce a peace treaty. The AA established a Military Demarcation Line (MDL) between the enemy forces, within a 4,000 meter (2.5 mile) “Demilitarized Zone” (DMZ) near the 38th parallel. The Neutral Nations Supervisory Commission (NNSC) was created to monitor the DMZ and armistice issues. The AA outlined rules such as what types of weapons were allowed in the DMZ. 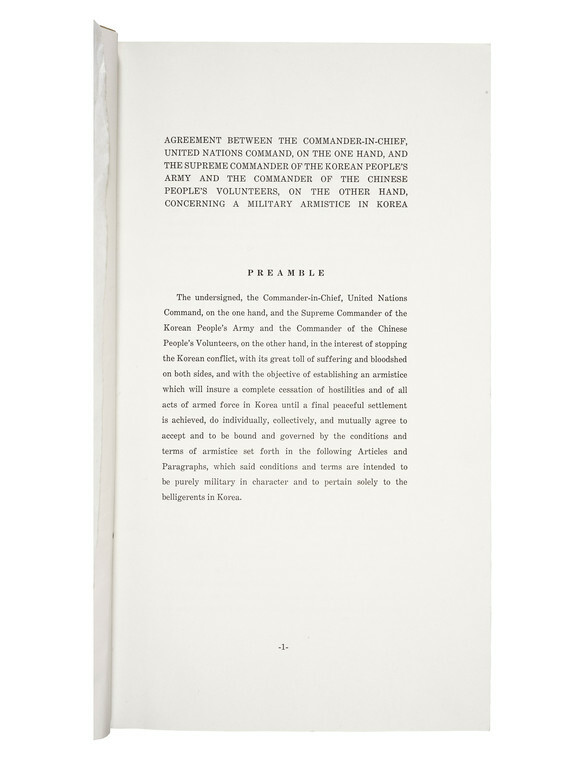 The Military Armistice Commission (MAC) provided a forum for the parties to resolve violations of the Agreement. It meets in the truce village of Panmunjom. Some issues were soon contested, such as the maritime boundary between North and South Korea in the Yellow (or West) Sea. The United Nations (U.S. and South Korea) enforce the Northern (or North) Limit Line (NLL), but North Korea disagrees. This has led to limited sea battles over the years, claiming the lives of an estimated 100 or more sailors from both sides. Combat along the land border has also killed and wounded many American and other troops. See www.dmzwar.com for information on the fight to secure the DMZ since 1953. While an imperfect mechanism, the AA has provided a venue for the sharing of positions and occasional actual negotiation between the parties. North Korea, which wants a direct peace treaty with the United States to replace the AA, has claimed it was pulling out of the AA several times, but then come back to participate in a least some of its operations. If Pyongyang was serious in 2013 when it again renounced the AA, it would mark a substantial escalation. That said, China is also a party to the AA and will mostly likely pressure North Korea to keep honoring its provisions. YONGSAN GARRISON, Seoul, Republic of Korea – For 60 years, the Armistice Agreement has ensured peace and stability on the Korean Peninsula. It concerns me when any signatory to a mutual agreement makes a public statement contrary to that agreement. As the UNC Commander, I am charged to fully enforce the conditions of the armistice. The success of the armistice has enabled the Republic of Korea to become a vibrant democracy and we remain ready to defend the Republic of Korea. 대한민국 ,서울 용산기지 – 정전협정은 지난 60년 동안 한반도에서 평화와 안정을 보장해왔습니다. 정전협정 서명 당사자가 상호 합의에 위배되는 공식 성명을 발표한 데 대해 우려를 표하는 바입니다. 유엔군사령관으로 본인은 정전협정을 이행해야할 전적인 책임이 있습니다. 정전협정의 성공적인 이행은 대한민국을 강력한 민주주의 국가로 성장하는 기반이 되었으며, 우리는 대한민국을 수호하기 위한 만반의 태세를 갖추고 있습니다. Pyongyang, March 6 (KCNA) — The crucial measures stated to the world by the Supreme Command of the Korean People’s Army are timely and decisive countermeasures aimed to defend the sovereignty of the country and its supreme interests from the U.S. moves for provoking a nuclear war. The step for making the Korean Armistice Agreement fully nullified is a great one that will make it possible to foil the U.S. and its allies’ attempt at a nuclear war at a single stroke and achieve at an early date the historic cause of national reunification. Almost six decades have passed since the Korean Armistice Agreement (AA) was signed but it has existed for form’s sake due to the U.S. systematic act of scrapping it. AA was just a tentative measure for starting negotiations on a political level within three months with an aim at withdrawing all foreign forces from the Korean Peninsula and ensuring lasting peace on it. But the U.S. deliberately extended the state of armistice. It concluded “mutual defence treaty” with the south Korean puppet forces in October 1953, making the U.S. forces’ presence in south Korea a fixed rule. Finally in June 1954, the U.S. intentionally disturbed the Geneva conference on the Korean Peninsula issue, thus blocking the way for the withdrawal of all foreign forces from Korea and the peaceful settlement of the Korean issue that were envisaged in the AA. For the past decades, the U.S. massively shipped war means including nuclear weapons into south Korea and stepped up the preparations for a new war, thus rendering the AA completely defunct. Nearly four decades have passed since a resolution on withdrawing all foreign forces from south Korea was adopted at the 30th UN General Assembly Session. But the U.S. has held dangerous nuclear war drills in south Korea on an annual basis while maintaining its military forces’ presence in it, constantly threatening and blackmailing the DPRK. It described the DPRK’s recent peaceful satellite launch and the nuclear test for self-defence as “challenges” to the international community and has stepped up hostile acts against the DPRK. From March 1st, it kicked off the Key Resolve and Foal Eagle joint war rehearsals with the involvement of south Korean army and even troops of its satellite countries. It seeks to turn the nuclear war rehearsals into an actual war while touting “preemptive nuclear strike”. This is an open declaration of a war against the DPRK and another grave provocation that totally scraps AA. Due to the U.S. reckless acts, AA has already been reduced to a dead document and there created on the Korean Peninsula a dangerous situation in which a war may break out any moment. The situation proves that the settlement of accounts with the U.S. should be done only with arms as the U.S. pays no heed to any convention or international law. The U.S., the world’s biggest possessor of nuclear weapons and the only nuclear war criminal state, has made it a fait accompli to provoke a nuclear war. For the DPRK it will be just like committing suicide to remain bound to AA which has now become a mere scrap of paper. The measure of the KPA Supreme Command on totally nullifying the effect of AA is another just one for defending the supreme interests of the nation. The revolutionary armed forces of the DPRK will mount Korean-style precision nuclear strike at any target any moment at its will and thus realize earlier the great cause of national reunification, the cherished desire of the Korean nation. Time will prove once again in practice how Songun Korea displays its will and capabilities to win a final victory. (b) Each Joint Observer Team shall be composed of not less than four (4) nor mire than six (6) officers of field grade, half of whom shall be appointed by the Commander-in- Chief, United Nations Command, and half of whom shall be appointed by the Commander-in-Chief, United Nations Command, and half of whom shall be appointed jointly by the Supreme Commander of the Korean People's Army and the Commander of the Chinese People's Volunteers. Additional personnel such as drivers, clerks, and interpreters shall be furnished by each side as required for the functioning of the Joint Observer Teams. (c) So that there may be no misunderstanding owing to the equal use of three languages, the act of delivery of a prisoner of war by one side to other side shall, for the purposes of the Armistice Agreement, be called "repatriation" in English, ( ) "Song Hwan" in Korean and ( ) "Ch'ien Fan" in Chinese, notwithstanding the nationality or place of residence of such prisoner of war. General, Korea People’s Army Senior Delegate, Delegation of the Korean People’s Army and the Chinese People’s Volunteers WILLIAM K. HARRISON, JR.